I would like to start out with an obvious statement, which we seem to reiterate over and over: drunken people aren’t very good at decisions. That’s why we keep having stories like one that happened last November, when a drunk man called police to help him start his car because he couldn’t figure it out himself. Then, of course, there was that Florida woman who was arrested for driving drunk because she was livestreaming the whole thing on Periscope. Finally, you can’t forget the drunk driver who betrayed man’s best friend back in October when, after a police chase which ended when he crashed into a house, he claimed that he hadn’t been driving drunk, because his dog had been driving (although there was no dog in the car or the scene). However, despite the condemnation and mockery these drunk drivers received and the contempt of Helen Mirren, drunken people continue to drive and do stupid things. Since we are new to Facebook, we were not quite sure what to expect from our post. We have received requests to post the video from this call. Some just didn’t believe it was true, so we have attached a short video of this call. The first portion of the video is in slow-motion and shows the car traveling in the opposite direction; the second portion shows the officer trying to stop the car and then as he approaches the driver. Yes, it is true and it happened! 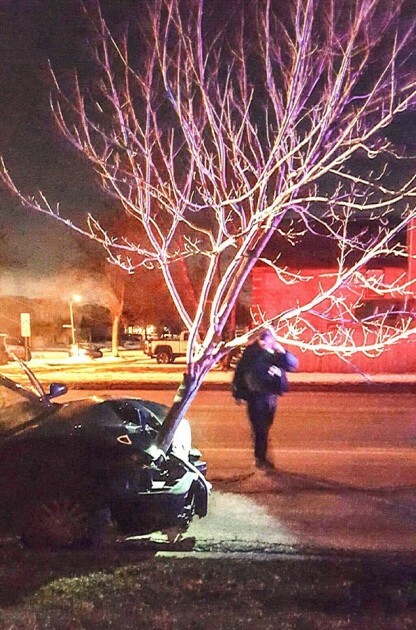 The woman driving the car was apparently so drunk that, after plowing straight into a tree (which broke off at the base and became stuck in the front of the car), she decided that there was nothing for it but to just keep going, brandishing her car’s new landscaping in front of her. “No, why?” replies the woman.